Nordic Design Plus is an outward opening, externally flush fitting PVCu casement window which was originally developed for the Scandinavian market and is now available in the UK. This PVCu casement window has a 120mm depth frame and has the appearance of a solid timber window of the type used extensively in cottages and stone properties in the UK and Ireland. This makes it an ideal replacement as it has authentic timber detailing and can incorporate traditional type hardware. This flush fitting system is also suitable for new build projects and multi-storey applications as has been the case extensively in Scandinavia. This window system incorporates REHAU‘s self reinforced RAU-FIPRO® material giving the window significant increased strength and thermal properties. Slim and elegant PVCu profile designs which will enhance the refurbishment of buildings. The flush finish sash creates the look of the most traditional of windows. No reinforcement required for a range of element sizes due to the incorporation of REHAU’s self- reinforced RAU-FIPRO® material giving the window strength and enhanced thermal properties. 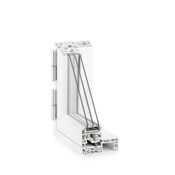 The 120mm frame depth and 67mm sash depth means that double glazed and triple glazed units can be accommodated.